AP EAMCET Results 2018: Andhra Pradesh EAMCET Results, marks and ranks to be declared on 2nd may at sche.ap.gov.in, manabadi websites. Students Can download AP EAMCET 2018 Engineering, Medical rank cards from here. Jawaharlal Nehru Technological University Kakinada (JNTUK) has successfully organized the AP EAMCET Examination on 22nd, 23rd and 24th April 2018 for Engineering candidates and on 25th April 2018 for Agriculture aspirants. All the students those have taken the EAMCET Examination in AP can check their result and download the rank card on 2nd May. Students can download the EAMCET Result, score card 2018 from the official website of AP EAMCET, sche.ap.gov.in. Students can visit the portal to know complete details. After completing the EAMCET Examination the JNTUK will announce the results within 2 weeks. This year the JNTUK has stated that it is going to announce results on 2nd May 2018. Candidates can check the AP EAMCET result, rank card, score, and weightage from the AP EAMCET official website, sche.ap.gov.in at the same time. 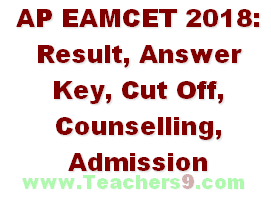 Fallow the below steps to download Manabadi AP EAMCET Result 2018. Go to the AP EAMCET official website sche.ap.gov.in. Find the Andhra Pradesh EAMCET 2018 Results and click on it. Enter details such as Hall Ticket number / DOB and submit the details. Finally, the status of your result will be shown in a new window through which you can know whether you are qualified or not. You can download the result Rank card or score card and save it for future reference. Download and Take a print copy of it for future use. Candidates shall be ranked in the order of merit as explained in the Annexure-IV. Rank obtained in AP EAMCET-2018 is valid for admission to the courses mentioned in the application form for the academic year 2018-2019 only. Rank card shall be downloaded from the website www.sche.ap.gov.in/eamcet Rank obtained with the benefit of relaxation of the minimum qualifying marks at AP EAMCET-2018 by any candidate claiming as SC/ST Category will be cancelled in case the claim is found to be invalid at the time of admission to any course of study in any participating University / Institution. Cutoff Marks will update after announcement.